4.5 stars really!!! 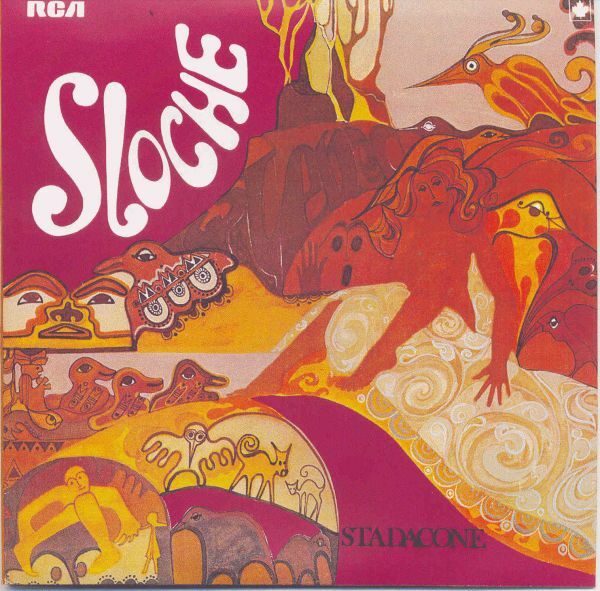 With a slightly changed line-up (drummer being replaced and an extre percussionist also), Sloche made an incredible confirmation with their second album, the stunning Amerindian-laced artwork covered StadaconÃ©. Still headed by the double keyboard attack and having plenty of back-up by their guitarist and the rest of the band, StadaconÃ© is relatively close to their debut although more towards Mahavishnu and GG, than the debut. One of the odd thing about this album is that it is dedicated to Pierre Boucard who helped write the two epics and that the album was recorded intwo distinct sessions produced by Ouellet for one and Desbien (who had done such a great job on their debut). Opening 10-min+ title track is already warning us that this album will be slightly more disjointed, but nothing to be alarmed: the spirit of J’un Oeuil is still there. The music is definitely funkier, sometimes even reaching the level of Hancock’s sextant or Headhunter (well, maybe not Headhunter ;-). Second is the only sung track (another slight change from the debut) of the album Cosmophile which brings us right back into their debut album, while one of the KB players plays a rare sax solo, too bad the song ends in a fade-out. Sauver Barbara is an organ-drenched syncopated funky jazz-rock that can help raise your mother-in-law from the dead (provided she is not too deeply buried of course, her name is Barbara and you cannot find her stash of dough ;-) while the second side opens on the Ad Hoc highlight and takes you towards a heavenly trip. Yet another short track (outside the two monster epics book-ending the album all other tracks are below the 5 min 30 mark) La Baloune is full of great ambiances with Murray again on woodwinds. Isacaaron is the splendid closing GG-esque track that is giving its all-out effort for the album’s personality compared to its debut. Most classical proghead fans will prefer their debut album, while the fusionhead will enjoy this album, but no matter what both albums are immensely successful and it is a complete shame Sloche will never be able to record a third album. Personally I prefer the debut to this album, mostly on the strength of much more present vocals, which despite their mostly instrumental nature was one of their strength. Thanks to Hughes/Sean for this excellent review.